Directed by Jon M. Chu starring Constance Wu, Michelle Yeoh, Henry Golding, Gemma Chan, Ken Jeong and Sonoya Misuno. Last edited by Nomis on August 13th, 2018, 6:37 am, edited 1 time in total. I saw a pre-screening earlier this week. I think I left my impressions in the movies watched thread, but below is my "review." The romantic comedy genre is a flavor that gets a bad rap for being one-note and heavily playing on sappy/silly tropes, even if that is not always the case. I have learned to expand my horizons when it comes to the genre and fit more good titles in there that don't necessary hit that mark. Last year, we were graced with the best of the genre staple I've seen in a long time in The Big Sick because of its strong writing. I am pleased to say that we have a winner again this year, and a lot of it has everything to do with how the editing complements the writing and directing. 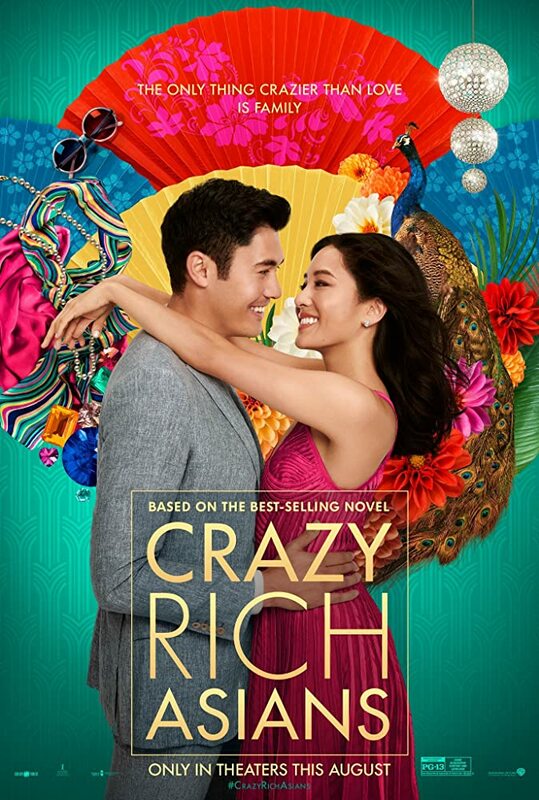 Crazy Rich Asians is an entry that treads lightly on both the romance and comedy (there are plenty of laughs to be had, I just never got an abs workout or fell out of my chair is all) and instead delivers a story built around culture, respect and trust, taking pages from Meet the Parents and The Devil Wears Prada. It is an absolutely accessible film for all audience members, even if they might have had *ehem* so good of a time that I couldn't hear some lines because of the overdrawn laughter from others. Through framing, editing and choice of music, director Jon Chu finds a way of bringing about action in a film that is entirely devoid of it. He really highlights Singapore as a character in the film full of vibrancy and vivacity, claiming set-pieces to dictate entire acts of the story. There is a lot of symbolism that is foreshadowed very subtly, and almost everything has a payoff instead of making the audience question what a certain setup was meant for. We get to see the crazy-rich invite us to their fantastical routines as side-characters like Awkwafina hilariously bask it all in and takes nothing for granted. We envy their possessions, even if we may not envy their lifestyle. The first 1/3rd of the film is wide-open throttle on the gas pedal. There are colorful overlays to indicate locations and text messages that mesh with what is going on in the image, and they feel as if they want to arrive to the story about as fast as Get Out. Characters are introduced so fast that you will want to bring a pad and pen to web-diagram the whole thing, but Chu made a smart choice in having the audience remember characters less by their names and faces and more with their actions, like when you play a name game icebreaker with a large unfamiliar group. You start to figure out where people stand on the totem pole (us audience members are clearly at the bottom) and get to enter Rachel's mind while she's absorbing things as a "fish out of water" at a breakneck pace, and we have to do the same. This representation may be that of the 1% end of things, but the wealth is only in your face from a glamorizing perspective and is not too in your face with snobbery constructed from their wallet and purse sizes. Once this is all enacted we reach the second 1/3rd of the film, which lets off of that gas pedal and coasts for quite a while. It hit me rather fast like brake lights and I wasn't expecting it, so I called the film out a bit on its inconsistent pace and didn't feel the typical story arc of "rising action." Thankfully, what was lost in that art was found in character chemistry and intensity. Our main protagonist couple is a duo worth rooting for as they yearn for a cathartic endgame with one another, despite what morals stand in their way. They drive the story's purpose, but they are on the bland end of personality when it comes to delivering the comedic goods, and this is totally okay; they let those around them bring us most of the character and laughs. A couple of them are thrown in for the cheap shtick, but there are nearly a dozen characters which get the limelight with their own romantic subplots. This ends up being more than just one love story, and normally I would consider this a detriment but this drawn out middle act of the film spends a lot of time establishing tangible and intangible values, and these characters' interactions are a big part of that. We get a lot of conversation regarding the betterment of characters from each side of the proverbial fence that separates rich versus not-rich, Chinese versus American cultures, and wants versus needs. In a movie that could have easily only stated messages for an elite class of individuals or specific ethnic group, they spend a long time catering to the other 99% so we can be a part of the journey and not just seeing it from a particular lens. I am purposely leaving out the story's pulse of tension between Rachel and Nick's mother, because I would like for you to strap in and see it all for yourself. As the film puts it at one point: it basically starts to feel like the two characters are playing chicken and they want to see who swerves away first. It doesn't quite reach Stiller vs. DeNiro or Hathaway vs. Streep in their respective film roles, but these two characters have a lot more to say that speaks to us and possible predicaments that we may encounter, especially regarding the ideas of family and what it means to be a part of one beyond the surface level. We transition into the final 1/3rd of the film where I feel the story arc had found its footing again. I was recognizing aspects of resolve taking place, affect brought personal emotions within me to rise more (I started to get the feels when a scene took place where the only thing you hear are the sultry echoes covering an Elvis Presley gem), and although this is a romantic comedy that may hit some of the stereotypes that other ones do, you don't dismiss it as a negative thing because the way we arrive at those points feels organic and validating. I could not predict where this story was going to go or what it wanted me to come home with earlier on, but by the time we hit the credits (there is one minor "mid-credits" moment thirty seconds in, in case you intend on leaving your chair immediately) I was completely understanding of Chu's conveyed intent that he displayed within the two-hour runtime. Ironically, his statement exceeds that of the film reel and the novel that this film adaptation is based upon. He is playing chicken with Hollywood, and I think he will strike victory here. Like Black Panther earlier this year and The Big Sick last year, we are beginning to realize that 'serving the underserved' is a good business strategy when there is a story to be told that requires exactly that. I am excited that both this film and Searching (please give that a look in a couple of weeks) is garnishing Asian leads without it feeling like an intolerable offense. Yes, one film is based upon that culture and the other just so happens to utilize characters of that background, but it just goes to show that mainstream audiences are willing to give them the benefit of the doubt and come out the other side with smiles on their faces, saying that the film is "good" and not needing to bat and eye over the fact that they were not graced on screen with a white male lead. I could have done my review without stating any of this, but I really think this is one part that separates this from many other romantic comedies. By the way, saying that it's "starring Ken Jeong" would be like saying that Up in the Air "stars Zach Galifianakis and J.K. Simmons." He has like twelve lines and shows up in a couple of scenes almost randomly after his first appearance.